Now, with federal approval of Kinder Morgan’s Trans Mountain pipeline expansion, the situation for the whales is about to get much worse and experts are predicting that the fragile population, which spends about six months a year in the Salish Sea, will not be able to survive the onslaught of tankers. “We don’t need to have an oil spill to have significant adverse effects — and no one is disputing that, not the National Energy Board, not Kinder Morgan and not federal scientists,” said Misty MacDuffee,a Raincoast Conservation Foundation biologist. Two years ago Raincoast called together top scientists with specialties in endangered populations and acoustics to do an analysis of the viability of the three pods of whales and the conclusion was that the population was on a precipice and could go either way, MacDuffee said. “Poor, poor whales. They are just surrounded and bombarded on all sides,” said whale researcher Paul Spong of a whale research station on Hanson Island, off northern Vancouver Island. 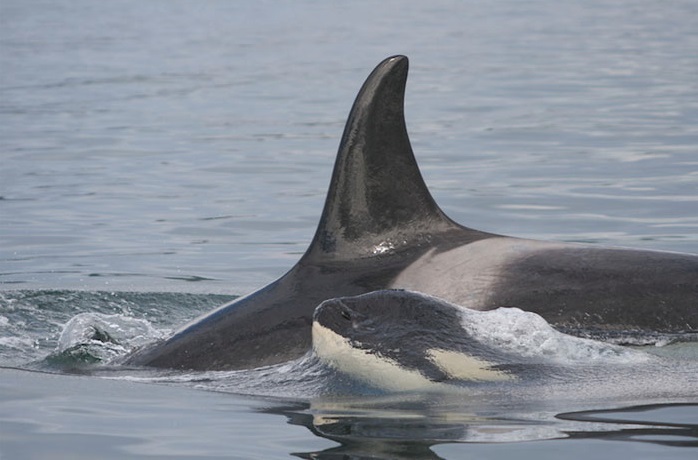 A Southern resident killer whale adult and calf. Photo: NOAA. In answer to questions from DeSmog Canada, a spokesman for Fisheries and Oceans Canada said DFO recognizes the need to address the cumulative effect of all marine traffic in the area. Also, the recently announced $1.5-billion investment in the Oceans Protection Plan will help address the cumulative effects of shipping on marine mammals, according to the statement.